It is no secret that I’m a huge Scrivener fan. I love it. For screencasts for my clients I’m writing a script of actions I’m going to perform and, more importantly, the text I’m going to speak. This is because I need to make sure that the client is fine with the text, otherwise I need to re-record and re-edit and all my previous work was pointless. 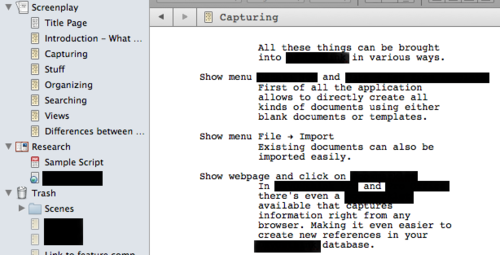 Shortcuts ⌥⌘1 to 9 (Format → Scriptwriting → Change Element to…) are your best friends. Or hit ⏎ at the beginning of a blank line. I had to reformat the compile settings though, as my clients expect me to send them a text file. I usually prefer to send standard plain-text files, because my clients are programmers and most of them prefer plain-text as well. (And I do too) But plain-text files don’t come out as beautiful as an RTF.